I'm glad that somebody requested that we upload something by Blonde Redhead. At one point they were one of my favorite bands, and until the other day I hadn't listened to them all that much in close to a year. I considered uploading the band's latest record, 23, but it isn't that great. If any of you really want it, I can upload it later. Instead, I decided to share their 2000 release, Melody Of Certain Damaged Lemons. This record along with Radiohead's Kid A pretty much defined my early high school years. Who knows, if I hadn't heard this album I might still be listening to nothing but punk rock. 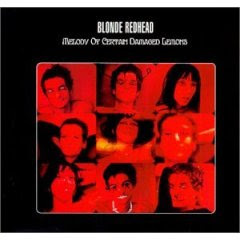 Blonde Redhead started their career really wanting to be Sonic Youth. I think their first record was even recorded by Sonic Youth drummer Steve Shelly. To the band's credit, a lot of their early material was actually better than some of the records Sonic Youth was releasing at the time. With Melody Of Certain Damaged Lemons Blonde Redhead emerged from Sonic Youth's shadow completely. Instead of focusing solely on dissonant guitars and bizarre tunings, the band started to incorporate synths into their music and really just wrote some flat out catchy tunes. I've honestly never met a person that has hated this record. Most of you have probably heard this before, so I've also uploaded a file containing all of the band's singles and EPs. A lot of the b-sides could have easily been album cuts. Hi Steve, great blog, and great albums. The link for EPs and singles does´nt work anymore. Please can you re upload? thanks a lot!. Cool blog as for me. I'd like to read something more concerning this matter. Thanks for posting this information.